5 Feudals planned to meet for unified front. ​ Nawabs, Sardars are curse of Balochistan, eradicate this parasites! Baloch people, do not support Sardars. Bugti received Gas Royalty from Pokistan in millions rupees every year for 40 years and not built a single road, school or hospital in Dera Bugti nor provided his native Dera Bugtan Gas to cook their food and keep their houses warm in winters. Instead the Gas Royalty money received was used to build palaces, forts and Private militia and baught land in sindh and Karachi, terrorized his opponent people, kidnapped and raped their women and make them to walk on burning charcoals and put them into his private jails to run a state within the state. 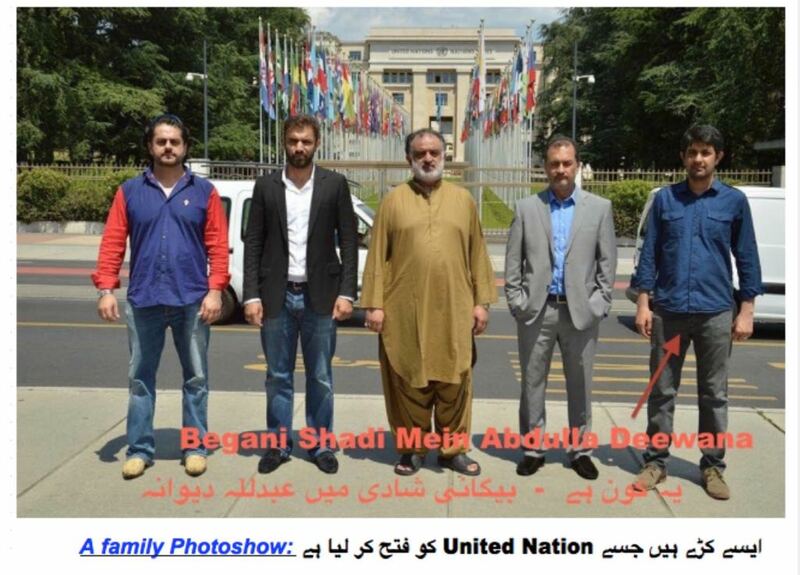 And now his Pokda idiot grandson with his Nawabi rotten mentality Bagoda Brhamdog Bugti sittings in Geneva, partying with champagne cheers with Indian money, thinks he own the Baloch movement and no one else should shout for Balochistan nor come close to it, like it is his grandpa personal property and inherited business. For him anyone who doesn’t kiss his a$$ hold his ashtray for him to smoke or is married to his sister is not a stakeholder in Balochistan and is a traitor and should be eliminated. Nawab Sardars are uniting once again against the Ordinary Baloch leaderships in Diaspora to hijack the Baloch struggle for personal gains and benefits. According to latest statement issue by the Looser Nawab Brhamdog Bugti, the head of BRA, a terrorist outfit, involved in killing innocent Baloch citizens in Balochistan in the name of liberation movement, has invited his cousins and relatives, Nawab Mehran Moron, the head of United Baloch Army (UBA) Mir Noordin Toordin and his father Javed Mengal, the head of World Baloch Congress (WBC) and Lashkar Balochistan(LeB), terrorist Hyrbiyar Marri, the head of Balochistan Liberation Army (BLA) and the international Pokda Mir Hammal Haider of BNM, (Begaani Shaadi main Abdullah Dewana), to Geneva to unite against the ordinary Baloch leadership, hijack Baloch struggle in Diaspora and to market the Baloch blood and tears in the international market and to to fool India to collect it for personal gain and champagne parties. Except Hammal Haider, the international Pokda of BNM, all other who have been invited by Brhamdog Bugti, are close relatives to each other. The international Pokda of BNM, Mr. Hammal Haider, is like Begaani Shaadi main Abdullah Dewana, and is totally irrelevant. BNM is a small political group of few Charsi delusional, daydreamers Pokdas inside Pakistan occupied Balochistan, who wants to establish a socialist and communist state in Balochistan through arms struggle, violence and terrorism. Their leader Chairman Charsi Khalil is on the loose and hiding inside Balochistan. BNM lost it support in Diaspora among the ordinary Baloch people, after they hired Charsi Zafar of Canada, a heavy smoker and heavy drinker, to promote their “Baloch Kush agenda” in North America to support the violence and terrorism of Baloch militants groups inside Balochistan. Charsi Zafar, a Canadian based jobless, lazy, Awara and Lafanga,originally from Karach Pokistan, an ex-member of Pakistan Communist Party, who keeps jumping like a monkey from one party to other (from Canadian Muslim Congress to BHRC and from BHRC to BNM to make a buck for his Charsi and whisky, was involved in honor killing of a young Baloch girl named Shaher Bano, who was killed by her religious husband in Scarborough Canada and Charsi Zafar called it a family matter to hushed it up and hide the facts. It is interesting to note that Khan Kalat, a key stakeholder and a pro-independent leader in exile, has not been invited, nor Professor Naela Quadri of WBWF, Dr. Jumma Marri of Baloch Unity, Munir Mengal of BV France and Dr. Wahid Baloch President of Washington D.C based Balochistan National Congress (BNC) has been invited. This is not the first time they tried to use such fancy slogans of unity to fool India and world community. The question is when were they disunited before that they are going to unite now??? The fact is that they have always been united against the ordinary Baloch leadership. 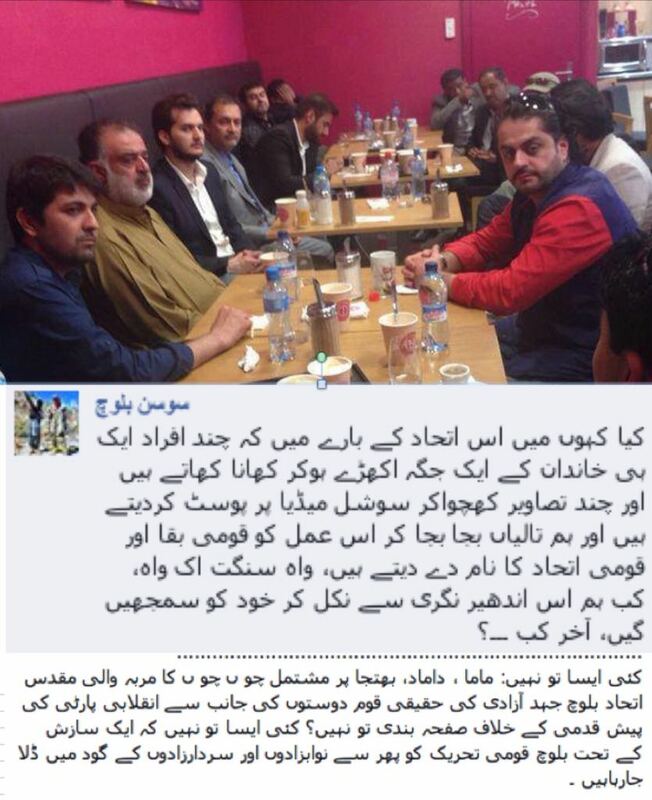 After losing the ground in Balochistan and being rejected in Diaspora by the Baloch activists these the disgruntled Nawabs and Sardars and their stupid sons with their stupid egos are now joining hands again to keep themselves politically alive after realizing and foreseeing their imminent political death in Diaspora. The war of their own survival and egotism have eventually made them to join hands together against the ordinary Baloch people. We ask the Baloch people in Balochistan and in Diaspora to not hold their breath nor pay any attention to their unity call nor to their streets dancing and photo shows. Imagine 4 militant groups ( BLA, BRA, UBA and LeB) within one family and still they claim to be united?? Death to all Nawabs and Sardars and their stupid sons. If they were sincere to unite they should have called a general meeting of all Balochistan’s steak holders and not just their cousins and relatives, collected suggestions and dissolved their individual organizations and groups, put their egos aside and created a new organization or institution based on suggestions and deliberations and held its first democratic elections to elect its body instead of self proclaiming their own leadership. This was the best way to unite. But we know that they are very much afraid to do it this way because they know that they will be defeated at the ballot and then they can not claim to be the Baloch representative and leader. And that’s why they are now uniting among themselves against the ordinary Baloch leadership to hijack the Baloch struggle, fool India and the world community, to collect it in the name of Baloch liberation movement. But, We will not let them to do so. We will continue to expose their fake unity slogans and their Nawabi and Sardari rotten sick mentality. We have to expose these thugs. In our life time they can not and will not use the Baloch struggle for personal gain and fan. Dr.Jumma Marri of Balochunity from Moscow said,”We rejected such family based unity and disown it. Neither they can fool international community or the Baloch people with such useless drink and enjoyment parties”. Nawab Sardars are uniting once again against the Ordinary Baloch leadership in Diaspora to hijack the Baloch struggle for personal gains and benefits. 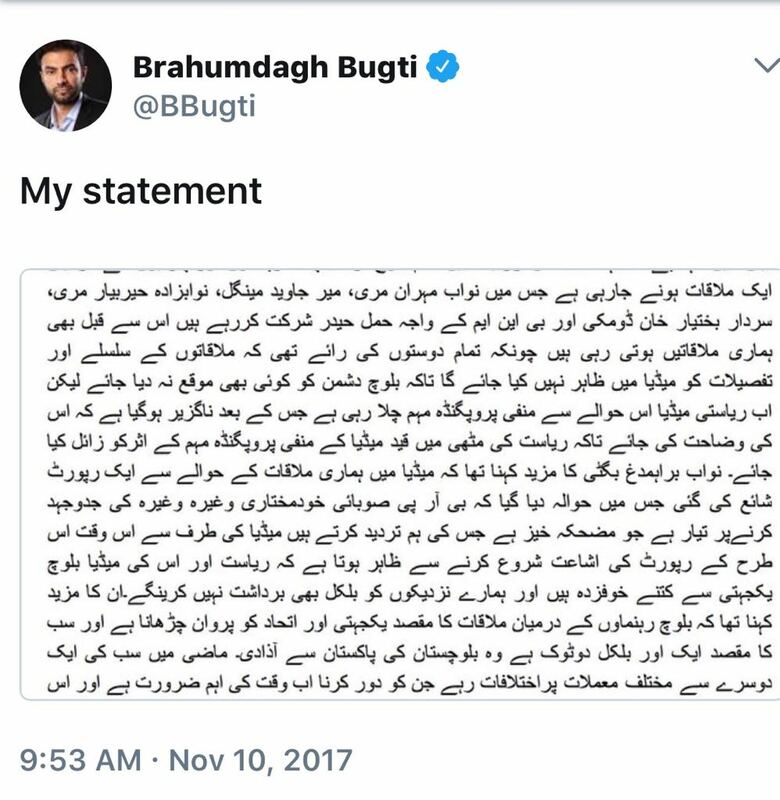 According to latest statement issue by the Looser Nawab Brhamdog Bugti, the head of BRA, a terrorist outfit, involved in killing innocent Baloch citizens in Balochistan in the name of liberation movement, he has invited his cousins and relatives, Nawab Mehran Moron, the head of United Baloch Army (UBA) Mir Noordin Toordin and his father Javed Mengal, the head of world Baloch Congress (WBC) and Lashkar Balochistan(LeB), terrorist Hyrbiyar Marri, the head of Balochistan Liberation Movement (BLA) and international Pokda Mir Hammal of BNM, (Begaani Shaadi main Abdullah Dewana), to Geneva to unite against the ordinary Baloch leadership, hijack Baloch struggle in Diaspora and to market the Baloch blood and tears in the international market to fool India to collect it for personal gain and champagne parties. It is interesting to note that Khan Kalat, a key steak holder and pro-independent leader in exile, is not been invited, nor Professor Naela Quadri of WBWF, Dr. Jumma Marri if Baloch unity, Munir Mengal of BV France and Dr. Wahid Baloch President of Washington D.C based Balochistan National Congress (BNC) has been invited. This is not the first time they tried to use such tactics and fancy slogans of unity to fool India and world community. 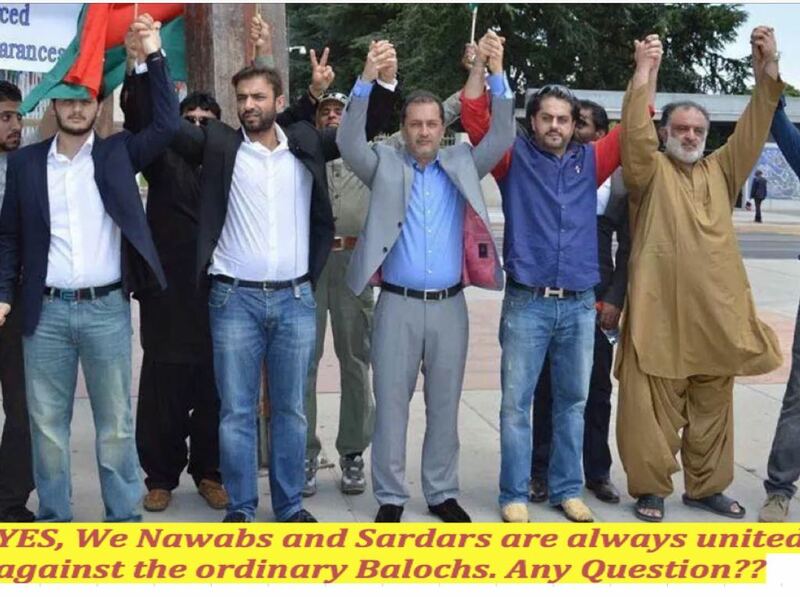 The fact is that they have always been united against the ordinary talented Baloch leadership. After losing the ground in Balochistan and being rejected in Diaspora by the Baloch activists these the disgruntled Nawabs and Sardars and their stupid sons with their stupid egos are now joining hands again, at least giving it another try, to keep themselves politically alive after seeing their defeat and imminent political death in Diaspora . We ask the Baloch people in Balochistan to not hold their breath nor pay any attention to their unity call or to their streets dancing and photo shows. All of them are irrelevant and useless, they are busy in killing innocent people and terrorizing and hurtinghis iwn people. I wouldn’t buy their unity call or slogans of Azadee. This is all about their survival after realizing that the movement is actually dead both inside Balochistan and as well as in Diaspora except with some photo shows on the Facebook. This was evident the other day when 4 Organization jointly protested in London and there was total 12 people, which mean each organization came with two or three persons. Now they know that they killed the movement with their stupid egos, they are trying to convince India that please don’t stop our bones we are uniting now. Does it really make a difference? Not at all. They were irrelevant and useless then and they are useless now. 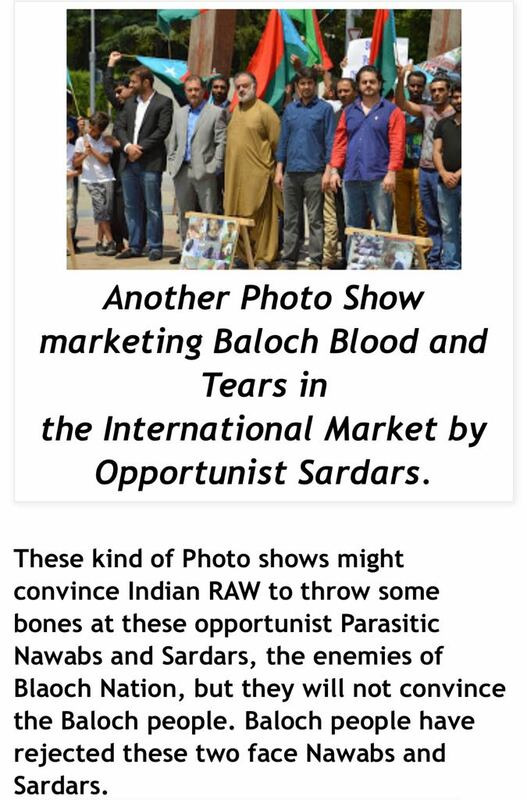 India must stop funding their violence and terrorism in Balochistan and their photo shows and street dancing along with their champagne parties in Diaspora, PERIOD. When were they against each other? We thought they were always united. Being brother in Law to each other, they were never un-united but been united against ordinary Baloch leadership from the day one. Who they trying to fool now? Were there any differences between them that we didn’t know?? What a bunch of looser idiots. They think they can fool India to throw more bones at them and at the same to fool Baloch people that they are now uniting against Pokistan. Actually they been working against the Baloch unity from the day one with their big egos and sick Nawabi and Sardari mentality. It is time that both these two idiot Nawabs should be admitted in a psychiatric hospital for their mental evaluation and treatment. They seriously need some help. After losing the ground in Balochistan and being rejected in Diaspora by the Baloch activists these two thugs and terrorists are now joining hands to keep themselves alive. The war of their own survival and egotism have eventually made them to join hands together. Imagine 4 militant groups (BLA, BRA, UBA and LeB) within one family and still they claim to be united?? Yesterday, it was the unity between Two Brother in-laws, today another brother in-law joining hands. All Nawabs’ and Sardars , all relatives by marriage. 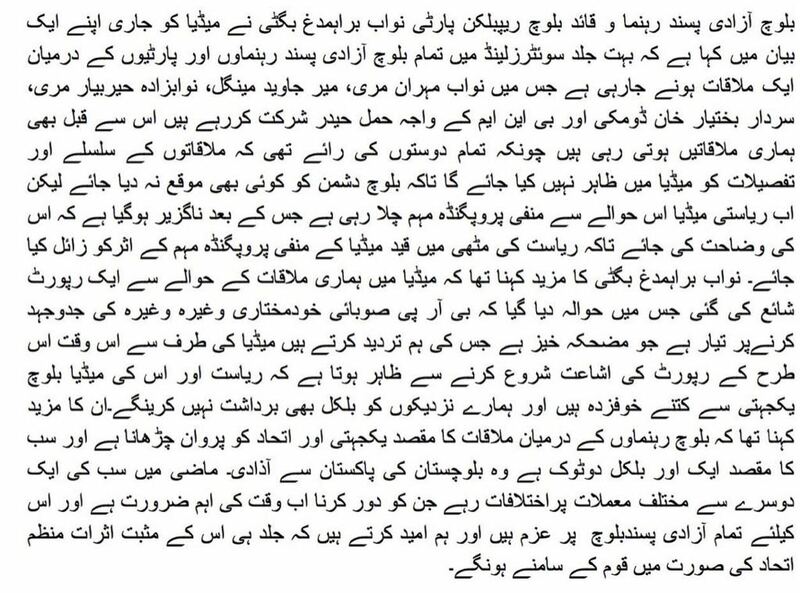 The real reason for joining hands by these Sardars are 1) they lost ground Support in balochistan 2) new leaders and groups from common masses are raising and hate these Sardars and mirs, nawabs 3) they cannot negotiate with Pakistan and make a deal ,as there are multiple groups . By joining hands they wish to sell themselves to the world as the only ligitimate leaders of balochistan and discrediting rest of the freedom seeking groups and activists , Particularly leaders of common masses. Sardarwatch strongly advice all non-Sardar Parties, groups, activists to be extra cautious. 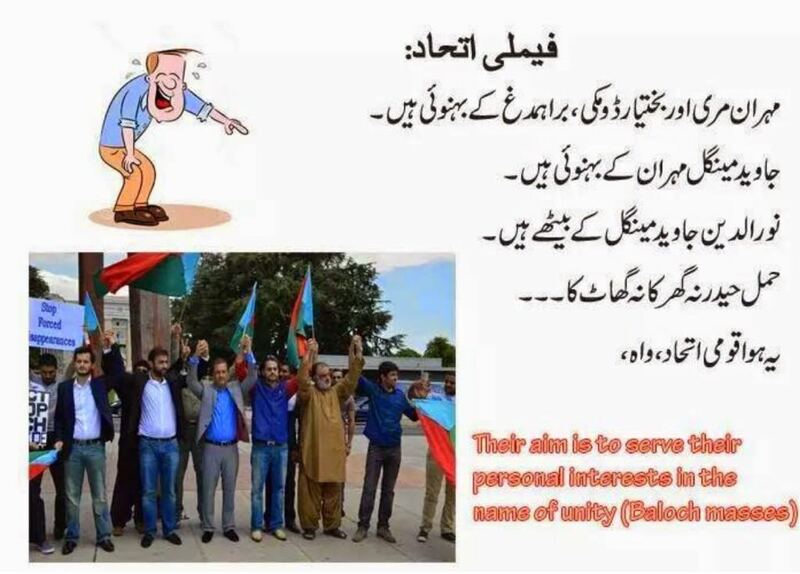 BNM and other common Baloch leaders are been used by these sardars in the name of unity. Overall this is a game plan to sell themselves as the sole point of contact of baloch struggle. London: 6 November 2017: Two key exiled Baloch pro-independence leaders head of Free Balochistan Movement Hyrbyair Marri and president of Baloch Republican Party, Brahumdagh Bugti held telephonic contact after long time. Both the leaders discussed the internal issue of Balochistan. The next meeting on high level delegations and leaders is due on 18 November this month in #Geneva. Mr.Hyrbyair and Mr.Brahumdagh agreed to continue fruitful dialogue in near future and Baloch nation will be updated about the meeting results as well. Party leaders thoroughly discussed the regional issues and their impacts on #BalochistanLiberationStruggle. The contact between two leaders has spread joys among the freedom seeking parties and common Baloch back to Balochistan because opening a channel for dialogue will benefit the freedom movement and will intensify the bilateral cooperation and will also help to resolve long lasting dead lock between Baloch parties for last many years. 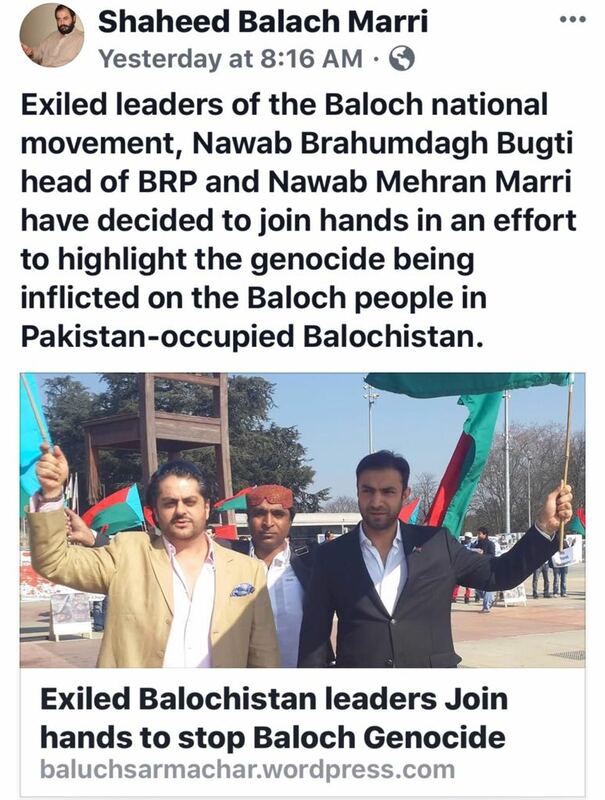 Mr.Marri living in United Kingdom and Mr.Bugti sought asylum in Switzerland, both have been vibrant and vocal on international level, Pakistani authorities have been misleading the international community by lodging fake cases against Hyrbyair and Brahumdagh to keep them away from their Nobel cause of liberation but had failed to do so. The contact of both the leaders spread hope among everyone in Balochistan and abroad.